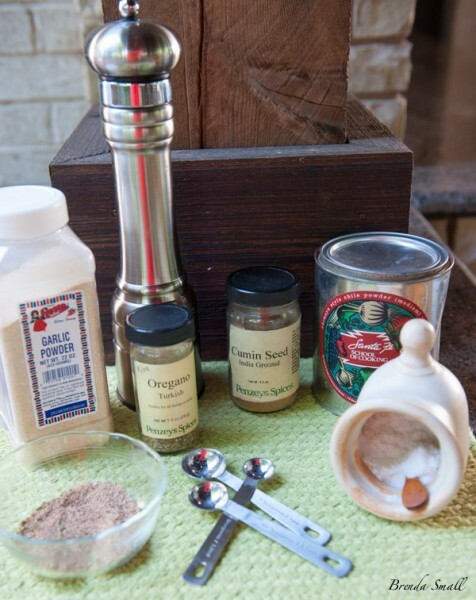 This yummy salmon rub is a staple in my pantry. The cumin, oregano, garlic powder, salt and fresh ground pepper are the perfect combination of seasonings to send salmon over the top! Cumin, oregano, garlic powder, chili powder, salt and fresh ground white pepper combine to enhance the flavor of the salmon. The flavor from the cedar plank and the grill are the coup de grace! I found this recipe years ago in the 1993 Fall edition of “Eating Well, Living Well” magazine. There was a special section on food from the Northwest United States. I had only cut the recipe out; so I had no information about where the recipe came from. Curiosity got the best of me; so after some research, this is what I found. The recipe came from the Salish Lodge which is located in Snoqualmie Falls, Washington, just 30 minutes east of Seattle. Check out the website, salishlodge.com. 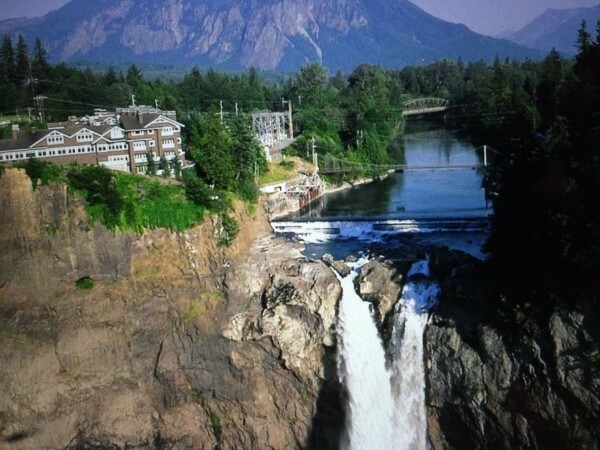 The lodge was built on the rim of the Snoqualmie Falls. It looks fabulous!! Apparently, they have a famous breakfast that has the Salish Potlatch Salmon with Wild Rice Cakes on the menu. That dish got rave reviews! 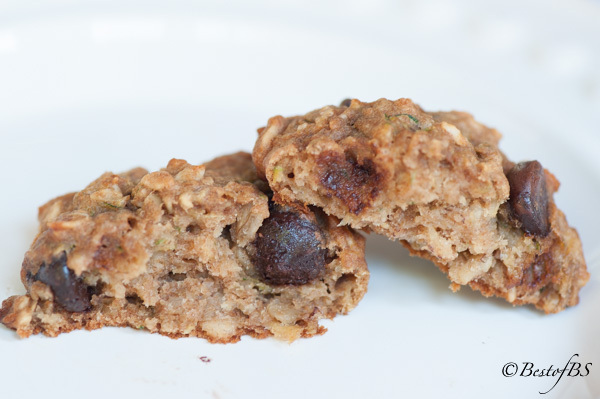 I have not tried the Wild Rice Cakes yet, but after the reviews, I can assure you I will be trying them. I’ll post the recipe if they are as good as the reviews say. The American Association of Endodontics meeting is in Seattle next year. I can assure you I will be looking into staying here for a few days. My friend, Donna, was recently in Seattle. She and a friend hiked to the base of the falls. She said it was absolutely beautiful. 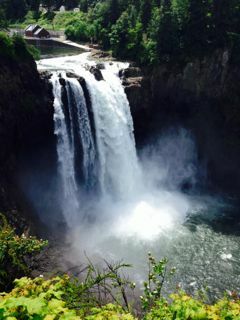 This is my friend Donna’s picture of the beautiful Snoqualmie Falls. OK, enough on the falls and back to the rub. If you are a salmon fan, this is the rub for you! So…here it is…just in time for the end of Summer Alaskan Salmon season. Be sure you double or triple the recipe for the rub, as you will want to keep it as a staple in your pantry if you have salmon as often as we do! I think it’s the best salmon rub I’ve tried, and I’ve tried a lot of them. 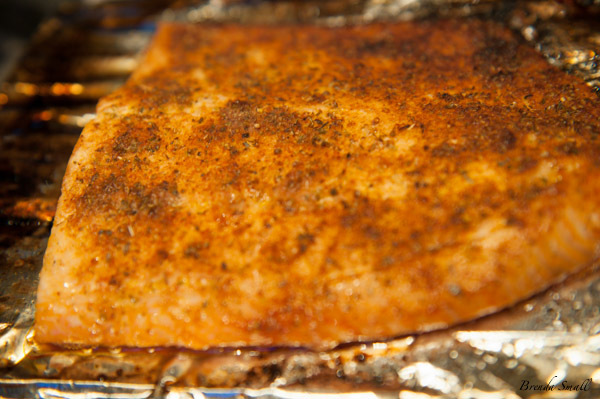 I have always cooked salmon on a cedar plank…that is until I didn’t. Two summers ago, Joel and Zach took a BBQ class at the Mansion restaurant. Actually, it was more of a Beer than a BBQ class! The one thing they learned that made the class worthwhile was cooking fish on a cookie cooling rack. This tip has changed my grilling technique for fish forever! I can now cook any type of fish, flaky or not, on the grill. 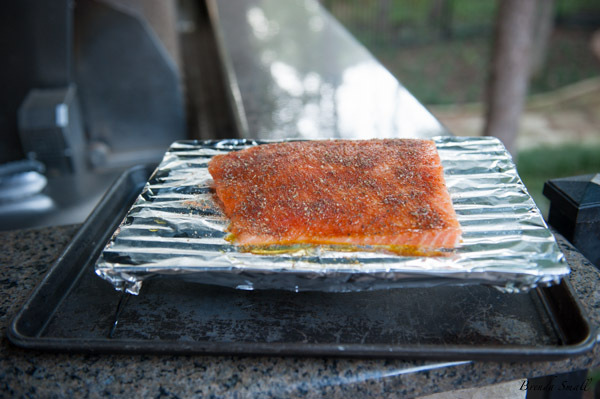 To avoid having to flip the fish on the grill (which can get really ugly with a flaky fish), you cook the fish on a cookie cooling rack that has been wrapped with aluminum foil. Use the cookie cooling rack that has legs that fold up and stack. They come 3 in a box, and I usually get them at TJMax. About the Cooling Rack Technique: I place the cookie cooling rack, with the legs open, on a cookie sheet with sides to keep the rack from sliding off…I’ve learned from experience! I use the cookie sheet to transport the fish to the grill and back as the cooling rack will be very hot when removed from the grill…imagine that! Wrap the top of the cooling rack with heavy-duty, aluminum foil, putting the shiny side up. 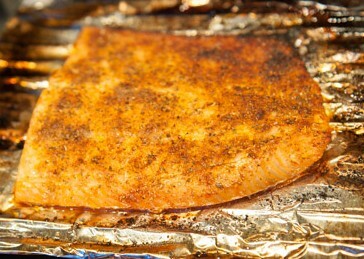 If the fish does not have skin, lightly spray the foil with a cooking spray like Pam. If it does have skin, be sure to put the skin side down, as it is a good thing for the skin to stick to the foil when serving. Place the fish on the foil lined rack. Prepare the fish as desired. Place the rack, legs open, on the preheated grill. When the fish is done, put the cooling rack back on the cookie sheet to carry. 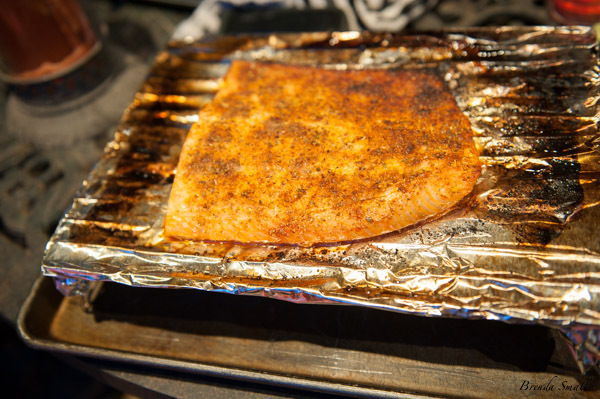 Back to the salmon recipe…I place the salmon on the foil lined, cookie cooling rack and rub the top side of the fillet with olive oil. Then I sprinkle a fairly liberal amount of the rub over the olive oil and pat the rub into the fish. The cookie sheet goes directly on the preheated grill grates. 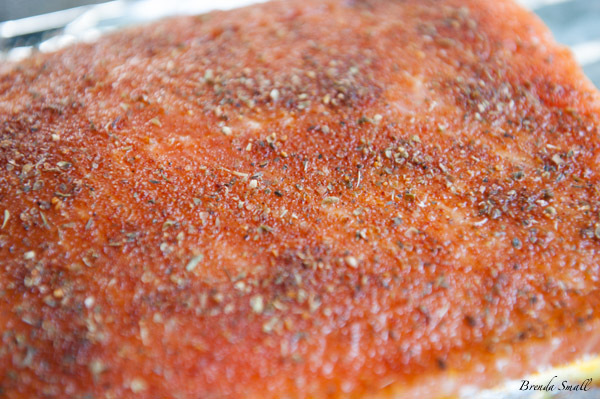 If the salmon fillet has skin on it, you do not have to use the cooling rack. You can grill it directly on the preheated, oiled grill grates…skin side up first for a short time just to get the grill marks, then using large spatulas, carefully flip the fillet, and cook on the other side until done. Do not flip again! Even when the fish has skin, I now usually cook it on the cookie sheet. That way, there is never any worry! This is what the cooling rack looks like wrapped in heavy-duty aluminum foil, shiny side up so it won’t reflect the heat. I put the cooling racks on my grilling cookie sheets…the ones I allow the guys to carve meat on. If there is skin on the fillet, put the fillet skin side down on the foil. This is the about the right amount of rub on the salmon. Here are the ingredients you will need. I use Bolner’s Fiesta brand garlic powder and chili powder (if I have it, I prefer New Mexico chili powder), Penzeys Turkish oregano, India ground cumin seeds and peppercorns and sea or Kosher salt. A good story involving ground cumin seeds. 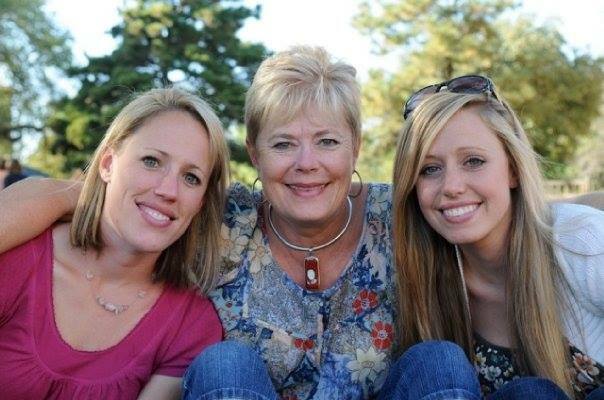 One of my daughters has never liked to cook, while the other one loves to cook…not saying which is which, but if you know the family, you know! When the kids move, I am always in charge of unpacking and organizing their kitchens. Both of the girls moved this year in April; so it was a busy month for me. The one who doesn’t like to cook (For the sake of using a name, I’ll just call her Jennifer.) called to see if I might remember if she had comino. As I mentally went through all of her spices, I knew exactly where it was. After explaining what the bottle looked like, she says, “I see the cumin, but I don’t see the comino.” OK…so it is the same thing, but it did take me some time to convince her of that. FYI comino is the Spanish word for cumin. Hope you will give this awesome rub a try, and please leave comments. I love hearing from my readers! In a small mixing bowl, whisk together (or shake in a jar with a tight fitting lid) all of the ingredients. I made this for my mother-in-law and she loved it…..very flavorful. I made a few servings of it and stored the rest in a container for later use, which is a great idea, thanks Brenda. Another great recipe!